As many of you know, I am passionate about using food as medicine to recover from Hashimoto’s symptoms. I have written many times about the dietary changes I made in my own life that led to my recovery, and I’ve worked with countless other people, with thyroid conditions, who have been able to take back their own health with the healing power of food. That is why I am so excited about my new book which was released this week, Hashimoto’s Food Pharmacology: Nutrition Protocols and Healing Recipes to Take Charge of Your Thyroid Health. If you haven’t picked up your copy yet, Amazon has it available at a discounted rate! While changing your diet in order to heal can seem restrictive at times, there are many ways that eating for thyroid health can still be fun and enjoyable. If you are far enough along in your recovery, you may even be able to throw in a glass of wine on occasion! In fact, many people don’t realize that, just as there are specific foods that can be used to address symptoms of Hashimoto’s, there are many wines with particular qualities that pair exceptionally well with some of the most common symptoms. 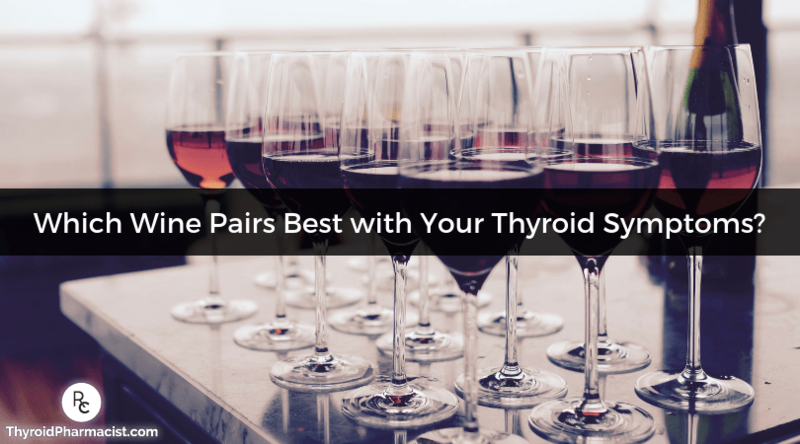 I spent hours running tests, going through bottle after bottle (and a few broken glasses) of wine, until I felt like I had landed on the perfect wines to pair with all of my thyroid symptoms. Fatigue – My go-to is a nice crisp Sauvignon Blanc from the Marlborough region of New Zealand. I find that the bright acidity and flavors of green apple really wake me up on days when my energy levels are particularly low — or maybe it’s just that I no longer feel concerned about everything I’m not getting done. Either way, after a couple of glasses, and after the green apple flavors wear off, I can nap for hours, which helps me restore my energy levels. Cold Intolerance – I find a bold Cabernet Sauvignon from the Napa Valley to be particularly warming during cold winter months, when I can’t seem to get warm. Not only do the notes of dark cherry and tobacco feel cozy on my palate, but the 15.5 percent alcohol level gets my body temperature up so high, I’ve been known to wear my swimsuit in January while drinking it! Brain Fog – I can’t remember. Something about wine. If you are just starting out on your healing journey, I don’t recommend consuming alcohol. Drinking alcohol can contribute to a leaky gut, blood sugar imbalances, SIBO, and a backlog in the liver (as it works to detoxify ethanol, or drinking alcohol). Once you’ve worked to heal your gut, removed toxins (including food and environmental toxins) from your life, supported your liver for some time, and feel you are well on your way to recovery, adding in the occasional glass of “healthy wine” will be possible for a lot of people. In the early days of my own Hashimoto’s journey, I felt awful after drinking any alcohol and did not tolerate it. Drinking even small amounts left me exhausted for days after. However, after getting into remission, I was able to enjoy the occasional glass of wine, margarita, or mojito with minimal issues. That said, people with thyroid conditions may have a reduced tolerance to the effects of alcohol, which can result in some nasty hangovers, even after a small amount of alcohol. 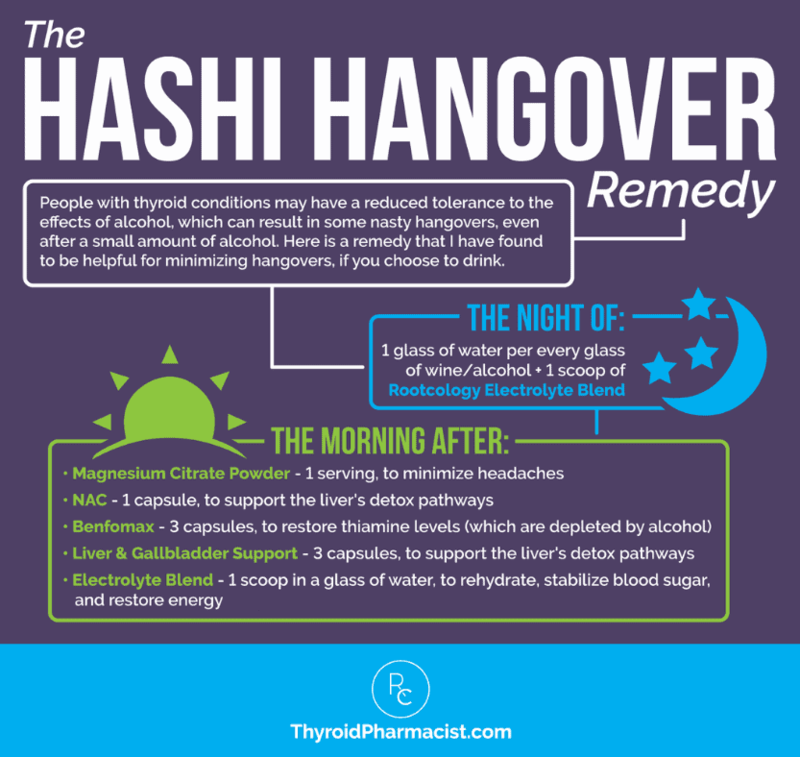 Here is a remedy that I have found helpful for minimizing hangovers, if you choose to drink. *Please note: Do not exceed more than 1 scoop of Rootcology Electrolyte Blend per day. Again, while there are some individuals who should stay away from consuming alcoholic beverages, others who are further along their healing journey may find that adding in the occasional glass of wine can be an enjoyable part of sharing a meal with their friends, and relaxing at the end of the day. If this is you, I’d like to introduce you to a wonderful source I’ve found for wines that are delicious, and won’t make you feel worse in the morning! Dry Farm Wines is the only health-focused, natural wine club in the world. They curate a selection of additive-free wines that are lab tested for purity. The creators of Dry Farm Wines were interested in creating wines that fit their low-carb and ketogenic lifestyles, didn’t hinder them from meeting their health goals, and left them feeling great the next day — all while providing delicious tastes for optimal enjoyment. Statistically Sugar/Carb Free: All their wines are lab tested for fructose and glucose, the two sugars found in wine; and all products by Dry Farm Wines are <1 g/L of total sugars, making them statistically sugar free. As Dry Farm Wines are statistically sugar free, and the carbohydrates in wine come from their sugar content, they are also statistically carb free. This is great news for people with Hashimoto’s who often follow a low-carb diet to keep blood sugar levels balanced. Mycotoxin/Mold Free: All their wines are tested for the mycotoxin Ochratoxin A (OCA), which is a toxin produced by mold. They meet the E.U. standard for screening, at less than 2 parts per billion of OCA. There is no standard or testing of U.S. Wines for OCA, but OCA is a known carcinogenic. Furthermore, molds can be a trigger for Hashimoto’s, so ensuring that wine is free of mold is crucial. Low Alcohol: The alcohol levels in wine can range from 7 to 24 percent alcohol by volume. However, the U.S. government does not require alcohol labeling to be accurate. It is simply “stated”, and there is zero U.S. enforcement for accuracy. Every bottle from Dry Farm Wines is tested to verify that it is at or below what is stated on the label, and none of their wines exceed a naturally occurring 12.5 percent alcohol level. Lower alcohol levels mean less burden on the liver, as well as lower levels of intoxication, so you can enjoy your glass of wine and keep your mind clear! Low Sulfites: All wines contain some sulfites (sulfur dioxide released during fermentation), as they are naturally occurring. Winemakers often add additional sulfites to wine, as a preservative. However, some people are sensitive to sulfites. This can be particularly true of people with Hashimoto’s who have food sensitivities and multiple chemical sensitivities. Common reactions can include headaches, congestion, itchy throat, and skin rashes. The U.S. government restricts added sulfites in wine to 350 ppm (parts per million). That said, Dry Farm Wines has created a standard not to exceed 75 ppm in their wines, and most of the wines they represent are below 50 ppm. Diet-Friendly: Because all of their wines are naturally lower in alcohol, are statistically sugar/carb free, and have not been found to make a significant impact on blood sugar levels or ketone production, Dry Farm Wines are compliant with Paleo, sugar free, carb free, and ketogenic nutritional programs. When you sign up to receive wine from Dry Farms, you’ll receive a monthly shipment of a unique selection of 6 or 12 biodynamic wines, sourced from small farms around the world. Each shipment includes different grape varieties and styles. It’s a wonderful way to try a variety of incredible wines, curated specifically for those of us who want to look after our health, while enjoying life in the process! I encourage you to give Dry Farm Wines a try and see that enjoying a glass of wine doesn’t have to come with all the undesirable side effects…. even if it doesn’t cure your Hashimoto’s symptoms! P.S. 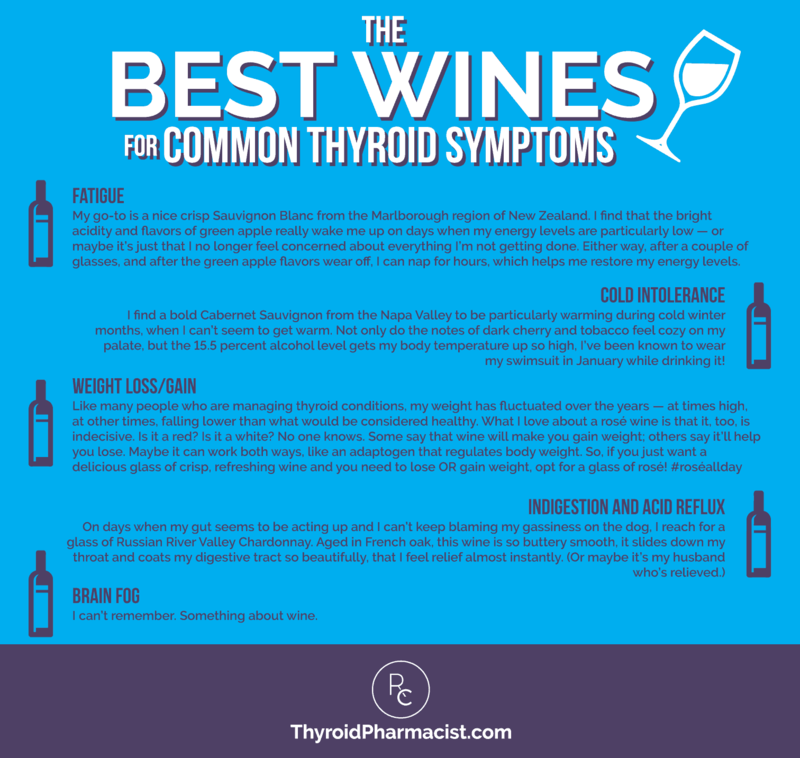 While wine may not be the best medicine for your thyroid symptoms, using food as medicine can be the solution! Don’t forget to pick up your copy of Hashimoto’s Food Pharmacology: Nutrition Protocols and Healing Recipes to Take Charge of Your Thyroid Health. I wrote this book to equip people with Hashimoto’s and autoimmune conditions with real food solutions to get better. This is for the non-chefs and non-nutritionists who want to take back control of their health. Click here to order now. P.P.S. Be sure to sign up for my weekly newsletter to get a free book chapter, recipes, the Thyroid Diet Starter Guide, and notifications about upcoming events and my latest research! Darn! I was so excited reading the beginning of this article. lol You got me! I am on an alcohol break till I feel better but look forward to having my Cabernet again. I miss my margaritas too but they are so sweet I may not get back to those again. LOL 😂. You got me! I was super excited and kept reading to the April Fools part! Great sense of humor and great job!! I’m currently reading through your books and wondering if you can give more specifics on what you mean by “remission”. Were you able to get your antibody levels to 0? Were you able to go off all thyroid hormone medications? Thank you! Thank you. I would still really like to know, when you reached what you considered remission for your body, were your autoimmune antibody numbers all the way to 0?